1938. "Swimwear model on bow of skiff at Marineland." You've come a long way, baby. 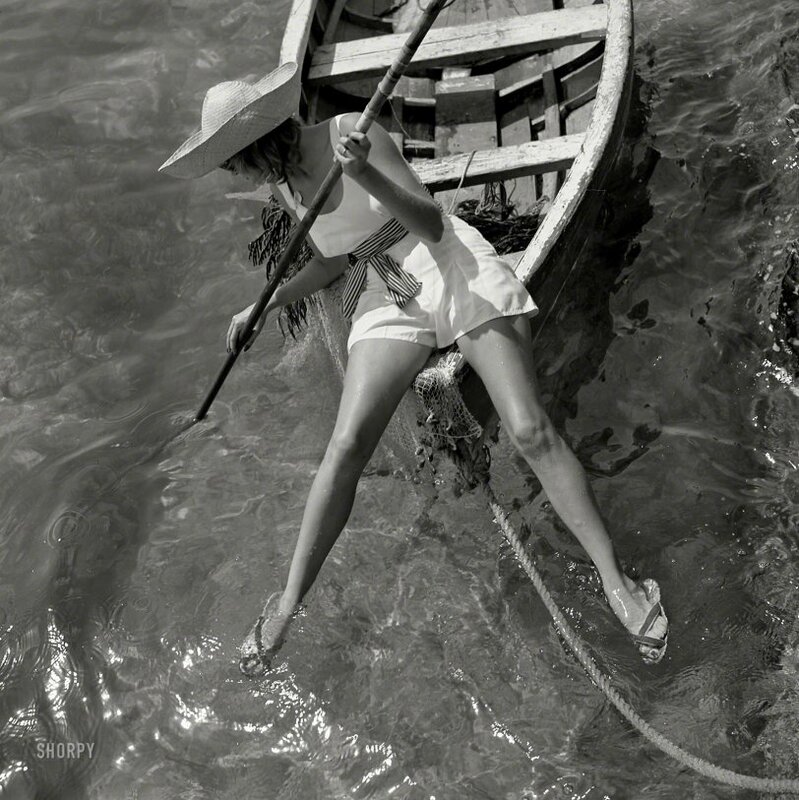 Medium format negative by Toni Frissell. View full size. Submitted by TonyB on Mon, 02/27/2017 - 7:40pm. For a CK or Chanel ad in Vogue today. Submitted by zzyzx on Sun, 02/26/2017 - 7:38pm. Where's that swimsuit-measuring cop when we need him? Submitted by Lost World on Sun, 02/26/2017 - 7:24pm. One of the few vintage models I've seen on Shorpy who would be considered highly desirable by today's standards. Submitted by rjoseph on Sun, 02/26/2017 - 5:25pm. Are we certain this is from 1938? It sure doesn't seem to fit in with that era. Submitted by Vonderbees on Sun, 02/26/2017 - 4:35pm. This young lady would have been my mother's age or even a little older. She would have been 99 this year. Submitted by jd taylor on Sun, 02/26/2017 - 4:07pm. Kind of breaks the whole model fantasy thing. Or at least nudges it in a different direction.